Continuing Professional Development (CPD) encompasses the wide variety of learning activities undertaken by professionals on an ongoing basis to maintain their technical knowledge and skills and to continually develop such competencies in existing and emerging areas. We consider CPD and the quality of advice and services to be directly correlated. For this reason, CPD plays an important part in our advisers’ professional and personal development within our business. Our advisers means our employees and directors and any employees and directors of our related bodies corporate who provide financial advice on our behalf. We are required to have a CPD policy which sets out our processes for ensuring our financial advisers who are our accountants which are authorised to provide advice under our Limited AFSL undertake CPD required to comply with the CPD legislative framework and ensure they are providing services to a competent and professional standard. This policy is published on our website and is also available internally to all staff. Approving CPD. We are responsible for approving activities as qualifying CPD. This requires us to ensure the CPD activity meets the requirements set out above. We will only approve the CPD activity as a qualifying CPD activity for the period of time in which the activity meets the requirements. This provides us with flexibility to pro-rate CPD where a portion of it met the requirements, but another portion of it did not. We will maintain a list of CPD which we have approved as a qualifying CPD activity along with the time period that can be attributed to that activity. Qualifying CPD may include seminars, presentations (whether provided internally or external) online education courses, conferences and reading material. 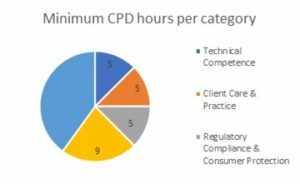 We are required to approve a sufficient number of qualifying CPD activities to enable advisers to meet their CPD requirements. Training Plans. This is the document that identifies areas where the adviser can improve their competence, knowledge and skills and describes the types of qualifying CPD activities the adviser will complete during the CPD year to achieve those improvements. We will work with the adviser to formulate a training plan which meets these objectives and our overall business strategy. We don’t approve training plans, unless the adviser is returning to work from a career-break. Supervision. We are responsible for ensuring advisers undertake qualifying CPD they are required to complete in accordance with their training plans. Their progress will be monitored throughout the CPD year, which may be in the form of regular catch-ups or reminders. Advisers are responsible for updating our training register promptly upon completing a qualifying CPD activity. Compliance with training plans is a key performance indicator for our advisers. We will provide them with all the assistance we can reasonably provide to ensure our advisers comply with their training plans. Where an adviser does not comply with their plan, this will affect their performance scorecard and may also lead to us restricting or revoking the adviser’s authority to provide financial advice. We will also comply with our legal obligations with respect to such failure, including reporting it on ASIC’s financial adviser register. Career Breaks. We are responsible for approving training plans for advisers who are returning to work after a continuous period of absence of least 2 years. These advisers cannot resume practice until we have approved their training plan. Approval of the training plan is at our absolute discretion, but at a minimum, we will need comfort that the training plan is appropriate in addressing all gaps in the adviser’s competence, knowledge and skills which have arisen as a result of their absence from practice.